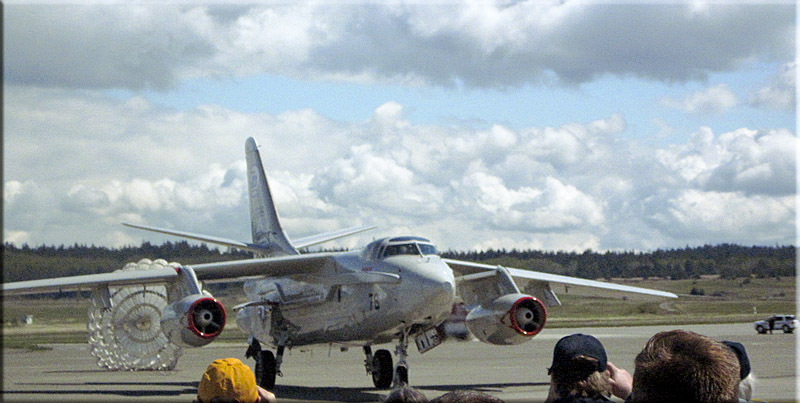 An A-3 Skywarrior retires at NAS Whidbey Island. 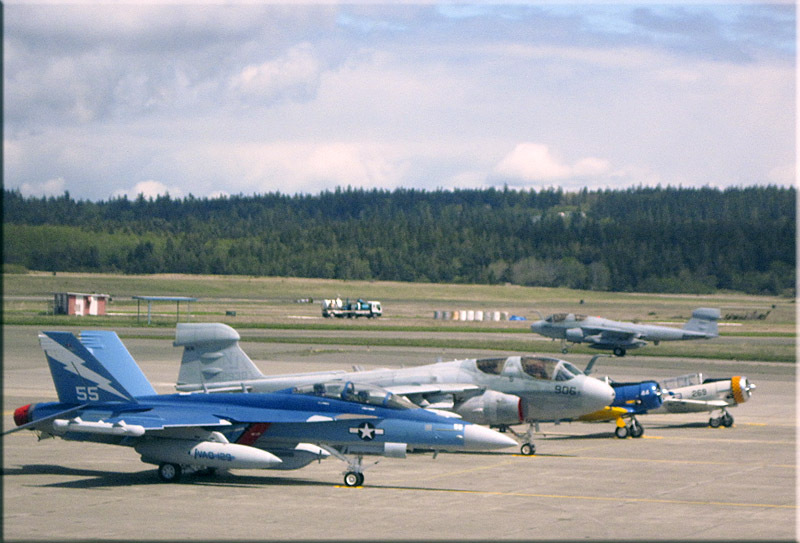 The EA-18G Growler and EA-6B Prowler in the foreground are third and second generation Electronic Warfare airplanes, the Growler just now replacing the Prowler in Navy VAQ squadrons. 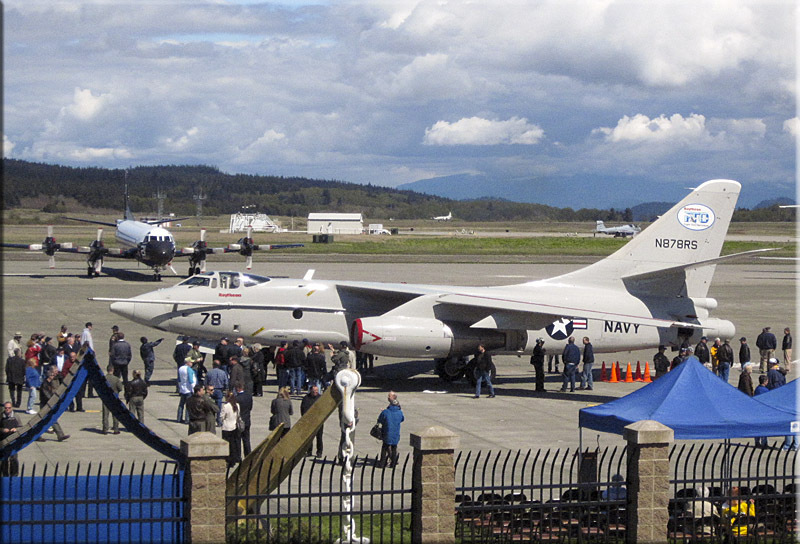 These are the successors to the A-3 Skywarrior, one of the last of which would retire at NAS Whidbey on this day. Two T-6 Texan trainers finish the row. A Prowler in the background taxis back to its ramp. Most of the A-3 Skywarriors were retired by 1991, however Raytheon Company was loaned 11 of the aircraft, and for twenty years used them to test new radar and electronic systems. The last of these airplanes were to be retired in 2011. 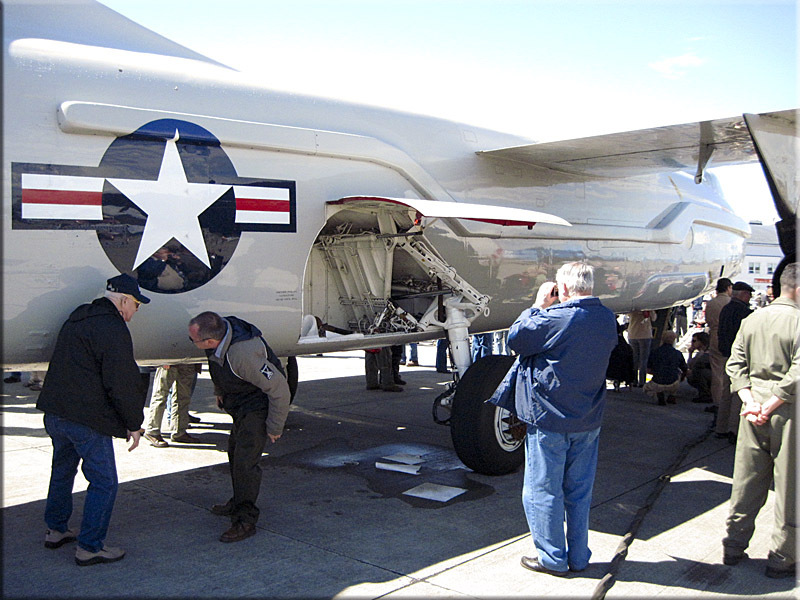 For two years, the A-3 Skywarrior Whidbey Project, in conjunction with the A-3 Skywarrior Association, lobbied and raised funds to get one of these aircraft to NAS Whidbey Island where it could be memorialized permanently. Some of the very first A-3s were based at NAS Whidbey Island, starting in 1957, so a great many memories reside in the area, of an airplane which filled so many important roles during the years of the Vietnam War and the Cold War. 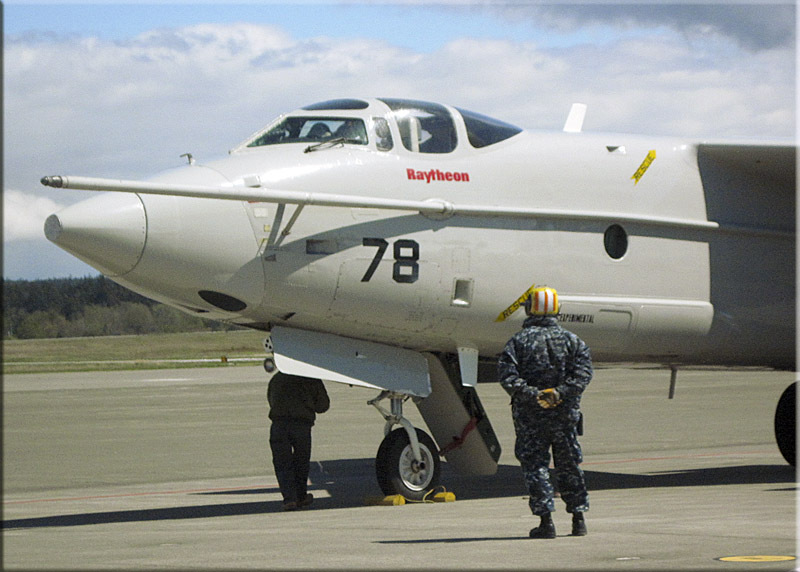 On April 29, 2011, one of the last three flying A-3's, Bureau No. 144825, flew from Van Nuys, California, to NAS Pt. Mugu, and on up to NAS Whidbey Island. The photos on this page document the celebration of the last flight of this airplane. 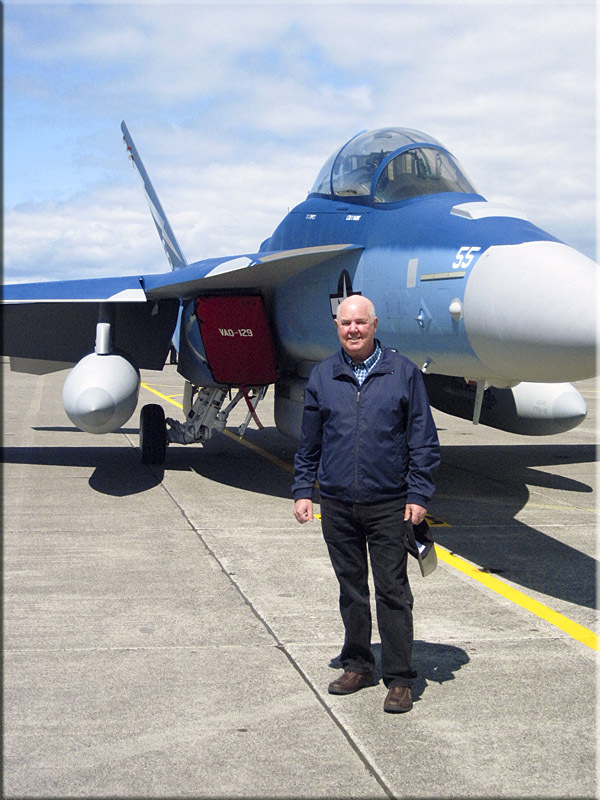 Don Webster in front of the EA-18G Growler. This derivative if the F-18, is just now replacing the EA-6Bs, which have been the dominant electronic warfare aircraft since 1973. It is these aircraft which deny the enemy the ability to see and communicate. They do their most important work during the most dangerous part of any war, the beginning. 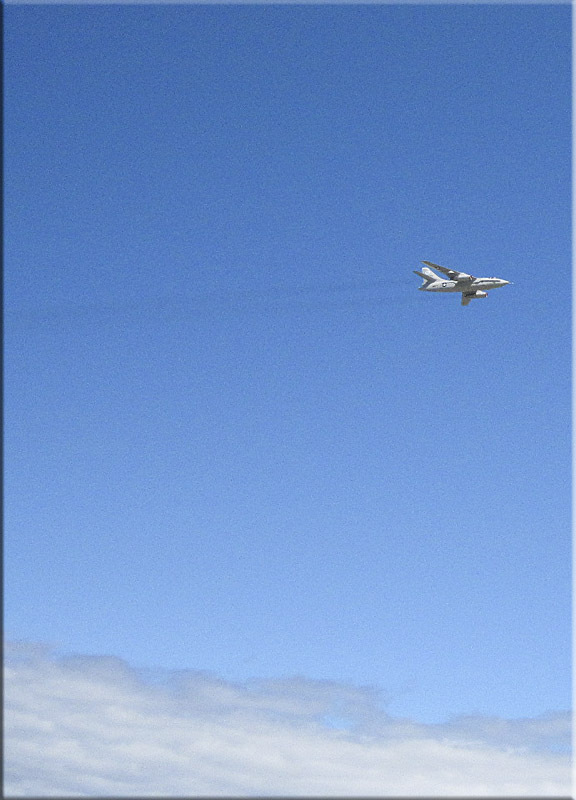 At the appointed time, the A-3 did a high speed fly-by and broke left, making a second pass. The "Whale" completing a left turn in front of its admirers. 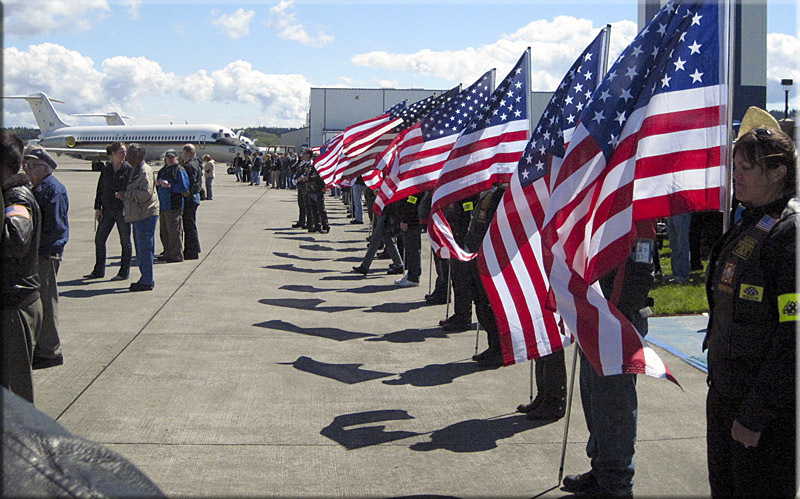 An honor guard of retired and active Navy personnel salute the A-3's final landing. 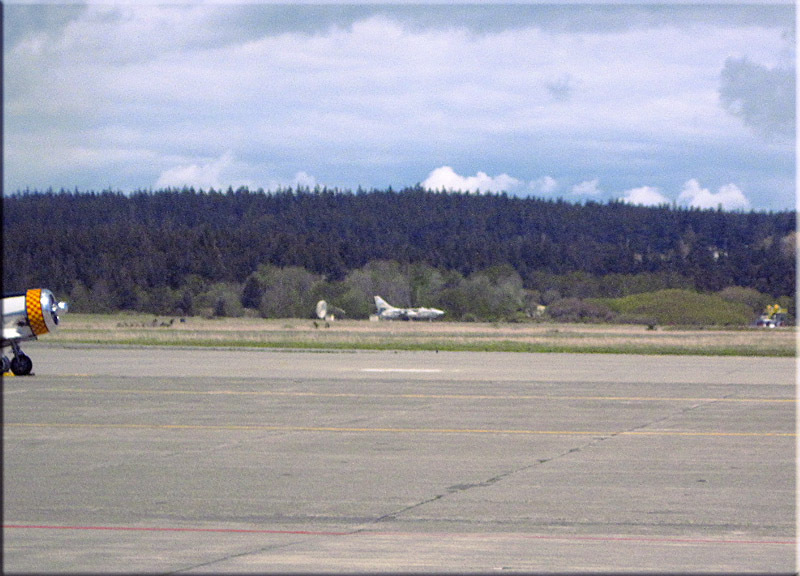 It's drag chute deployed, the A-3 rolls out on the final landing of its 46 year service life. 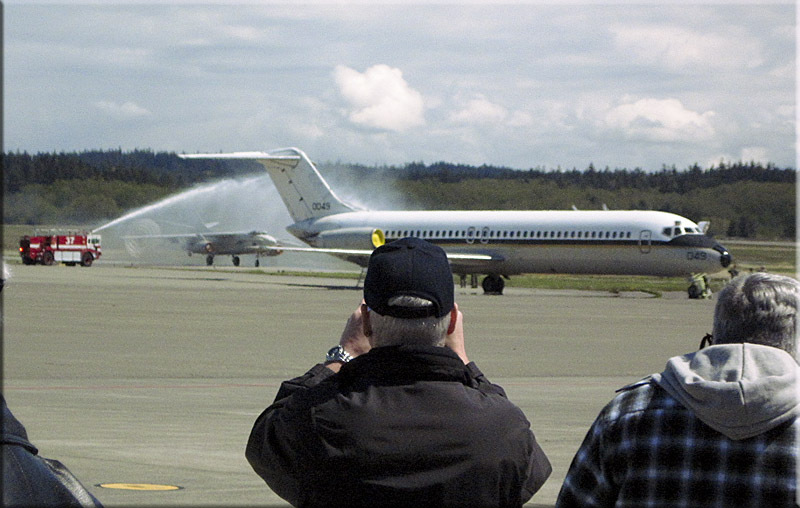 By tradition, following their last landing, pilots and aircraft are saluted with a water arch. The "Whale" makes its final turn before parking on the Base Operations Ramp. It was standard to use the drag chute for all field landings. The A-3 had first generation anti-skid brakes. Even with this anti-skid, it was easy to pop the tires if the brakes were applied with the slightest aggression. Of course, on the aircraft carrier, the tail hook stopped the airplane. Before shutting down, safety pins are installed in the explosive evacuation slide and in each of the landing gear. The A-3 was the only jet to operate from the aircraft carrier without ejection seats. The entrance door below the cockpit had an explosive charge which would blow the door down and lock it in an emergency. The crew, always wearing parachutes, would evacuate down the slide. 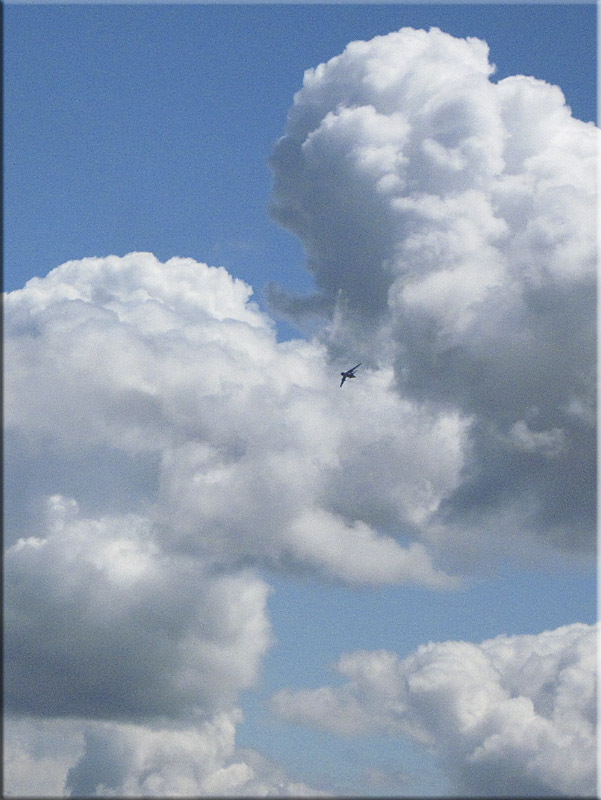 If this was done with enough altitude, these evacuations were usually successful. Many A-3s were shot down during the Vietnam War, usually during photo reconnaissance following an air strike. Evacuations occurred for a variety of other emergencies during the many years that the plane was operational. 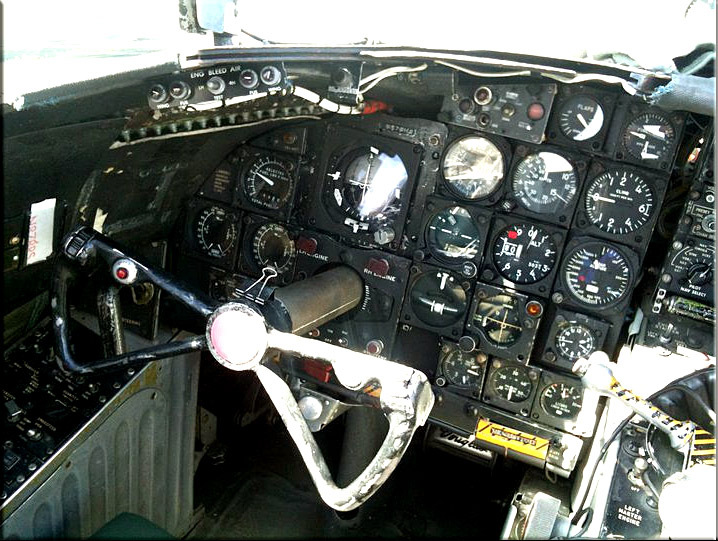 The one hundred or so former operators of the A-3 were happy to see and touch an airplane which was the source of extreme memories, both good and bad. This cockpit isn't pretty, but it did the job. Very important is the on-speed indicator at the top of the photo, near the left. It allowed us to monitor the aircraft speed precisely while looking outside at the carrier deck and at the "meatball," a set of lights on the carrier that showed us our precise glidepath. Below 500 feet, the concetration level was intense, and the focus almost entirely outside. One used the pitch sound of the engines to make tiny power corrections. A final shot of the A-3 Skywarrior, the largest aircraft to operate from aircraft carriers. It was an inspirational day. It was great to see the A-3 given a proper home, where it can be enjoyed. I talked with a circle of active duty pilots and naval flight officers in my old squadron, VAQ 135, who are now transitioning from the Prowler to the Growler. Their recent flying has been in Afghanistan. They are undergoing the long family separations that are part of doing six month cruises on aircraft carriers. Yet, they could not have been more upbeat and motivated. For those of us who had been away from the military environment for some time, it was a great tonic to be in the company of these committed, disciplined individuals.